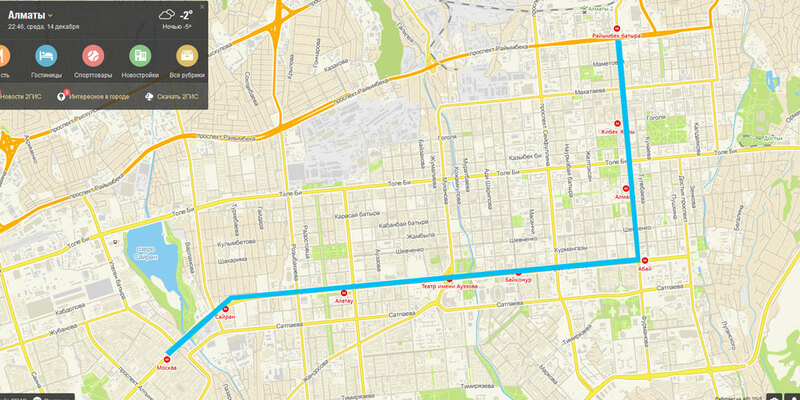 Coming to a new city the main question is what area you must choose to stay. 3) and of course, the price in the selected area must be adequate, leaving half of the budget only for rent, it is not very nice. When it comes to Almaty, you should also pay attention to the environmental situation in the selected area; unfortunately, the city has not crystal clear air. For normal orientation in Almaty, you need to know two things, first is that the locals divide the city into upper and lower part, as the city is located at the foot of the mountains the area closer to the mountains is considered to be the top of the city. The second - the set of streets after independence have been renamed, so out of habit the locals often call the old names of some streets, if you ask the way, it is necessary to specify what name of street was called, new or old. Maps of the city, as a rule, contain new street names. 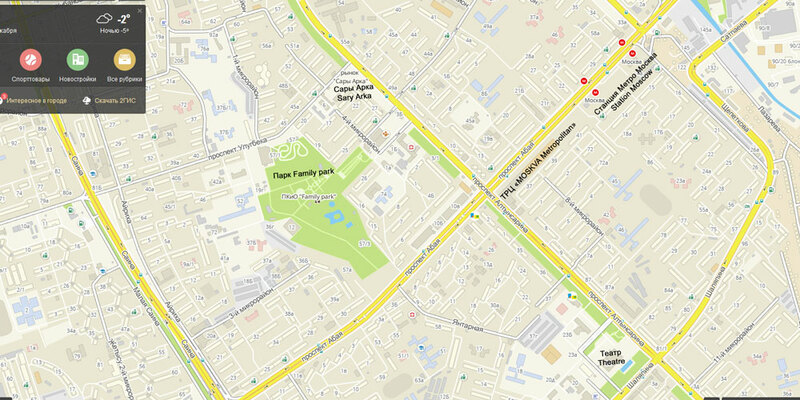 Information about online maps of the city, you can find in this article. For financial and tourist center can be certainly attributed Medeu district (Медеуский район), as it is the area with the most expensive real estate. 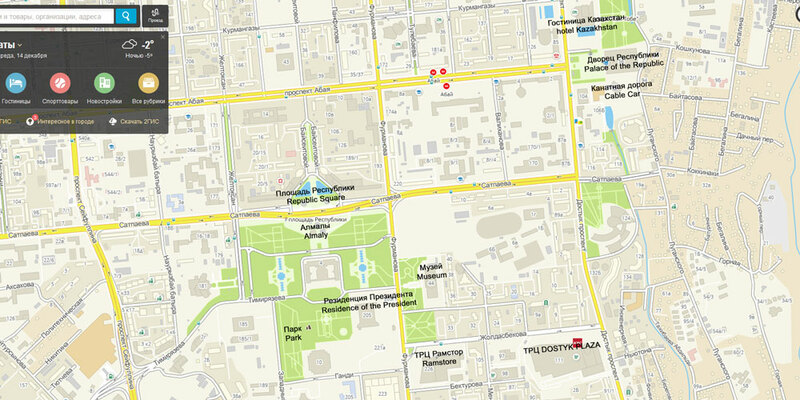 On Furmanov street (улица Фурманова) above Satpayev street (улица Сатпаева), at the intersection of Bostandyk and Medeu districts, there are Republic Square, underground shopping and entertainment complex «Almaly» (Алмалы), Central State Museum of Kazakhstan, Almaty residence of the President, First President’s Foundation Park, supermarket «Ramstore», elite micro-districts Samal 1, 2, 3 and closer to Dostyk Avenue (проспект Достык) shopping and entertainment center «DOSTYK PLAZA». Not far from the «Dostyk PLAZA», at the crossroads of Abay (проспект Абая) with Dostyk Avenue, you will find the Palace of the Republic, famous hotel «Kazakhstan» and the cable car to the mountain «Kok-Tobe» (Кок-Тобе), on which the city’s TV tower are located. Up by Dostyk Avenue, which goes into the street Gornaya (Горная), it is the world’s highest mountain skating rink «Medeu» (Медеу) and the ski resort «Chimbulak» (Чимбулак). 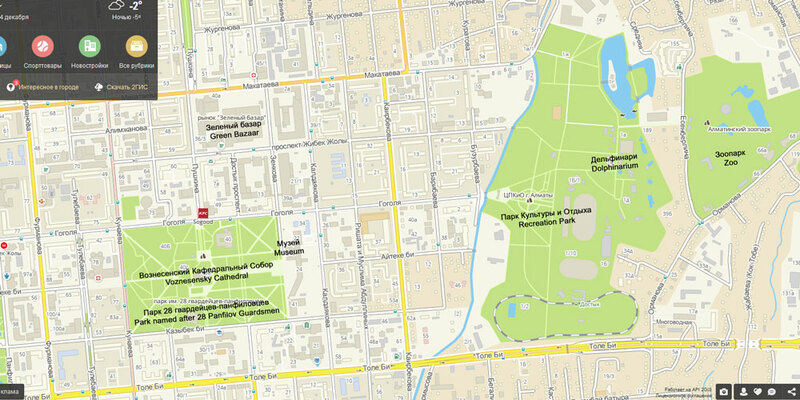 At the lower part of Medeu district, the area of crossing the streets Furmanov and Gogol (улица Гоголя), a park named after 28 Panfilov Guardsmen (28 гвардейцев-панфиловцев), Voznesensky Cathedral, Kazakh Museum of Folk Musical Instruments, market «Green Bazaar» (Зеленый базар) (former Central Farmers Market), east on Gogol Street recreation park in Almaty, Almaty zoo and dolphinarium. Second, according to expensiveness of residence, the city district – Bostandyk (Бостандыкский). To the west from crossing of the Abay Avenue and Baitursynov Street (улица Байтурсынова) is Sports and Cultural Complex named after Baluan Sholak (им. Балуана Шолака), shopping and entertainment center «PROMENADE», central stadium, central swimming pool, park «Fantasy World» (Мир фантазий), Kazakh State Circus and the Kazakh State Academic Theater named after M. Auezov (им. М. Ауэзова), I shall specify, the theater is located on the territory of Almaly district. On the streets of Rozybakiev (улица Розыбакиева), before you reach the Al-Farabi avenue (проспект Аль-Фараби), you will find one of the most popular shopping and entertainment centers of the city «Mega Center Alma-Ata» and the Ferris wheel «HappyEye» the height is 60 meters, near the «Mega Center Alma-Ata» is located park of the First President of the Republic of Kazakhstan. Closes the top three districts with the most expensive real estate – Almaly (Алмалинский район). 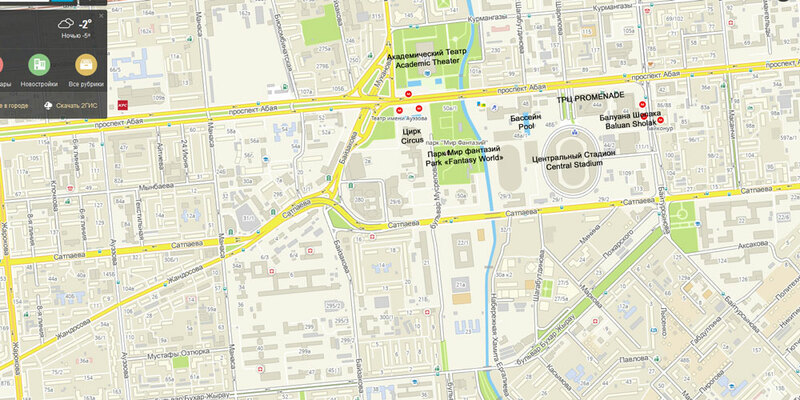 In this area you will find the State Academic Opera and Ballet Theatre named after Abay (им. Абая), Astana Square, Arbat, central department store «Zangar» and a lot of popular cafés and restaurants. If you decide to settle in the Almaly district, I do not recommend to take apartments in Arbat area, as housing in this part of town, often rented by the hour for loving couples and noisy companies. 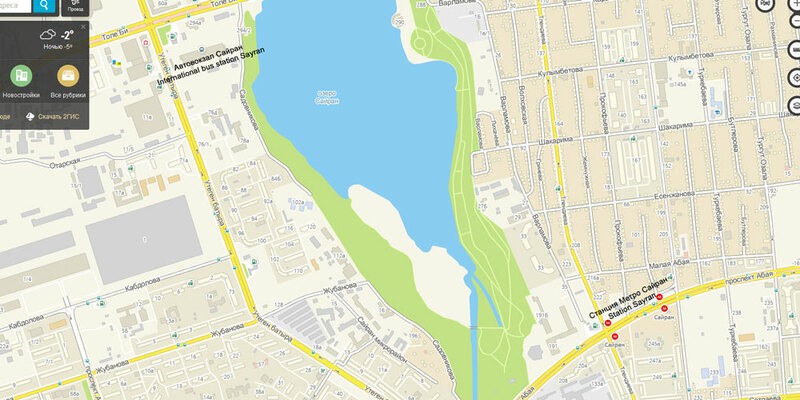 I would like to draw the attention of people in the first time visiting Almaty, that the area of the street Sain (улица Саина) below Abay avenue to the street Zhubanov (улица Жубанова) and near the railway station «Almaty-1» up along the avenue Seifullin (проспект Сейфуллина) to street Akan Sery (улица Акан Серы), are considered to be so-called «red light district». 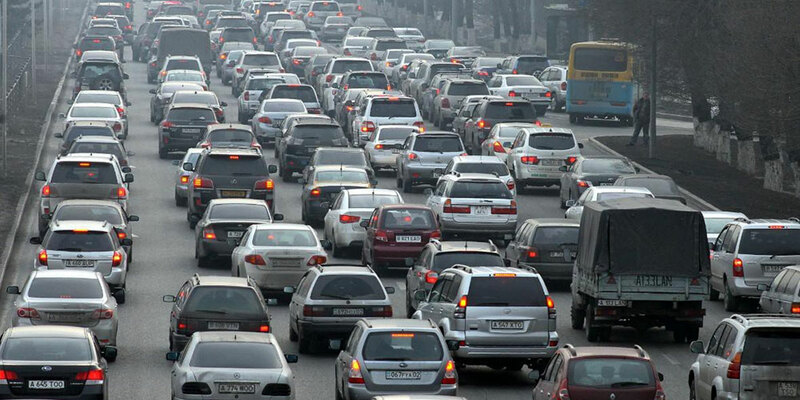 The main problems of Almaty include traffic congestion and air pollution; I think it is problems of many cities. In Almaty there are about half a million cars, plus daily come in about 200 thousand cars from countryside. 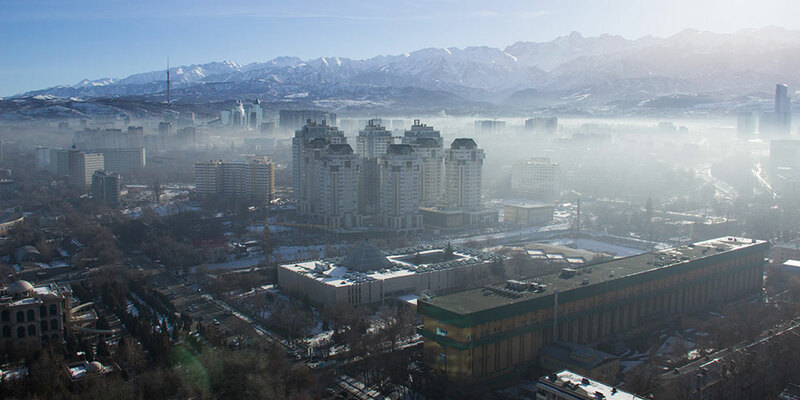 A large stream of cars seriously affects the ecological situation, the main source of air pollution is the exhaust gases, Almaty is located in the hollow, due to which it is bad ventilated. It is considered to be environmentally the more favorable upper areas of the city above the Abay Avenue, closer to the mountains. The transport problem can be solved by choosing areas not far from the subway station, Almaty subway is comfortable enough and goes through the central part of the city, the road from one end to the other takes about 20 – 25 minutes. The most budget district corresponding to the above criteria is Auezov (Ауэзовский район) – the sleeping area of the city. 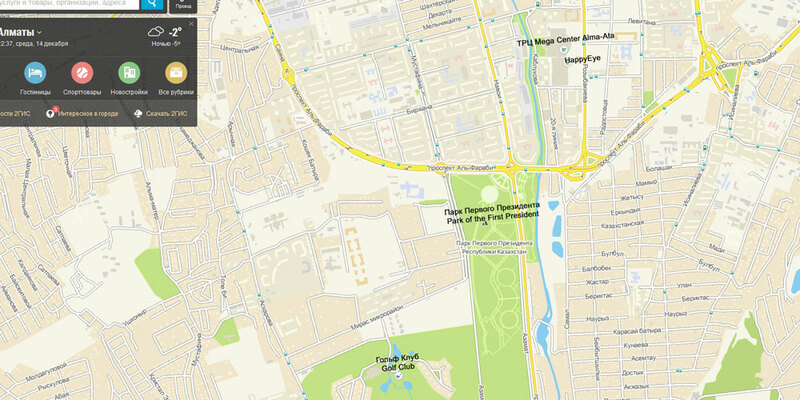 It is worth noting that at the area of crossing of Abay Avenue and Altynsarin (проспект Алтынсарина) has a good infrastructure, underground station «Moscow», the new shopping and entertainment center «MOSKVA Metropolitan», Food and clothing market «Sary Arka» (Сары Арка) and the recreation park «Family park». Up the avenue Altynsarin is the State Academic Russian Theatre for Children and Youth named after N. Sats (им. Н. Сац). At the crossroads of Tole Bi and Utegen Batyr (улицы Толе Би и Утеген Батыра) is an international bus station «Sayran» (Сайран). Also, a low cost rental options can be found in the area of «Sayran» metro station – it is the territory of Bostandyk and Almaly districts. In conclusion, it should be noted that Almaty has to offer a lot of accommodation options, from hotels with a worldwide reputation to more budget apartments and hostels. For booking a hotel you can use the service booking.com, for rent hostels and apartments suitable airbnb.com, I want to note that there were cases of replacing the selected apartments for various far-fetched reasons and increasing the cost of rent, so I recommend to choose the proven owners. Apartment rent options also can be viewed on local site krisha.kz, though in the site it is not possible online booking, use this resource for booking, you rely on the honesty and integrity of real estate owner.